Joe Strummer - A legend. Learn about his music, bands, albums, rigntones, lyrics and other Joe related information. 11/17/15 - Updated all the iTunes buttons on the site. Now they all work, yay! 01/16/13 - The City of Granada named a plaza in Joe Strummer's honor. 11/05/12 - See a Joe production: Meeting Joe Strummer, playing 19th-22nd December at The Cockpit in London. 10/30/12 - These guys sell Vintage T-Shirts. They have a clash section. 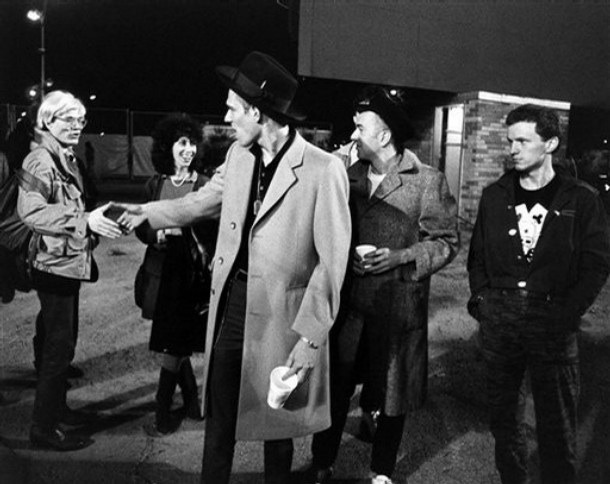 03/21/12 - A Conversation on Cool posted a picture of the Clash meeting Andy Warhol. 01/09/12 - Added iTunes Ringtones to the Ringtones Page. 09/11/11 - Ten years ago Joe said: There's got to be some good that comes out of [the attacks]...Maybe people are just going to be nicer to each other. Because it's just too horrible. The world just can't be that bad. It just can't be. 08/21/11 - Tomorrow is Joe's birthday. Happy Birthday Joe. 12/22/09 - Joe Strummer, nine years gone. We still miss you Joe.